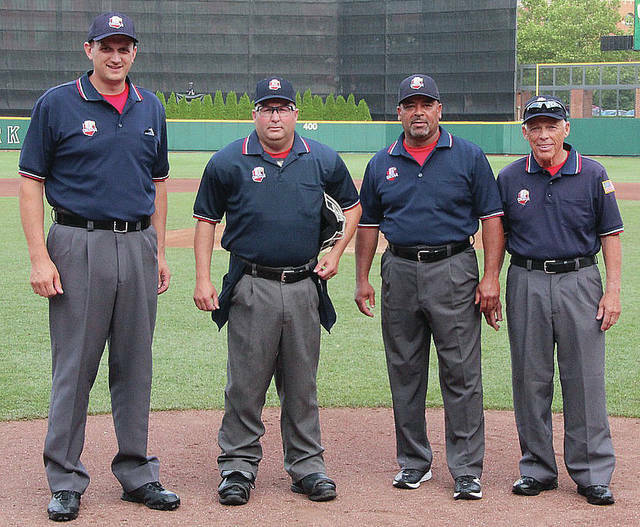 Sidney native and Anna resident Scott Barr, second from left, poses with an umpire crew before the Division II state championship last June at Huntington Park in Columbus. The rest of the crew is made Chris Prokes, left, of Vandalia; Roger Dicks, second from right, of Cincinnati; and Tim Kuhner, formerly of Minster. We are seeing a significant shortage of baseball and softball umpires in our region. Too few are starting and many are retiring each year. The West Central Ohio Baseball Umpires Association offers starter classes, ongoing education, and hands on clinics. I’d like to share with you my story. It is hard to believe almost 30 years ago I started umpiring at Custenborder Park in Sidney. Wayne Shoffner, a 44 year umpire and former varsity baseball and legion coach, convinced me to try. My summer job in high school was umpiring youth baseball in the evening and weekends and I made $20 behind the plate and $10 for the bases. I purchased my own gear with my earnings. After umpiring the Sidney All-Star tournament, I was approached by leaders of the Vandalia tournament. They asked if I would be interested in umpiring their two weekend All-Star tournament. My first year, I drove down as a 16 year old high school student. I was unloading my gear from the trunk and to my surprise, a golf cart pulled up and took me to my field. I would do five and six games a day on Saturdays and Sundays during the weekend tournaments. It was great money for a high school student. By the time I graduated high school, I was umpiring the Sidney, Vandalia, Tipp City and Troy Strawberry festival All-Star tournaments. You would see some of the same teams and coaches and they started to call me the “Sidney” umpire. Even when opposing teams played the Sidney All-Star teams, they knew they were going to get a fair game with a quality official. To my surprise, one of the summers at Vandalia, the championship game after the two-weekend tournament came down to Sidney’s top team versus Vandalia’s top team. Remind you, I am from Sidney and in Vandalia. I started packing up my gear and a Vandalia tournament official came up to me and instructed me not to leave. You have the championship game behind the plate. They realized I would be fair and impartial to both teams. When I was 19, I took the Ohio High School Athletic Association umpires test and started umpiring ACME baseball. I went to college at the Ohio State University and started umpiring in Columbus. I went anywhere the assigner sent me. One day I worked with a gentlemen in Lancaster that was assigned to observe me. That was my break in Columbus. I started getting varsity games and then started working in the big Ohio Athletic Conference (OAC). After graduation I attended the Jim Evan’s Academy of Professional Umpiring in Kissimmee, Florida, for a five-week umpire’s school to go to the Minor Leagues. Although it was an experience of a lifetime and made be a much better umpire, I missed out by few slots. Coming back to Columbus, I joined the real world and umpired games after work. For nine years I worked the best games in the OAC and started getting into college baseball. My highest level was the University of Dayton at the Ohio State University behind the plate. The rumors are true, I ejected the U.D. head coach in the seventh inning over balls and strikes. I have had less than five ejections in my entire career. My wife grew up in Anna and we decided to move back to Shelby County to raise our family. I re-joined the West Central Ohio Baseball Umpire’s Association in Piqua. My job in banking made it difficult to umpire and I would only do Saturdays and maybe one game a week. For the last six years my current job has allowed me significant flexibility to umpire. Coaches in the area have treated me well. I have been blessed to be selected to umpire regional finals the past two years as the crew chief and home plate umpire. My crew this year in the reginal finals went on to umpire the Division II state championship at Huntington Park in Columbus where I was the crew chief and home plate umpire. It was a humbling experience. Umpiring has been a great part of my life. I have been able to stay close to a game I love. You get nice spending money, games today pay between $50 and $70 for high school. You build wonderful relationships with fellow umpires, coaches, and players. We, however, are at a great shortage of umpires. Some start and after three or four years quit, many times due to fans or parents. The OHSAA and the school districts are doing a good job addressing this with the “Respect the Game” initiative. I encourage former baseball or softball players, youth coaches whose children are out of school, and anyone that enjoys the game to consider signing up for the new umpire classes offered by the West Central Ohio Umpire’s Association. We currently assign for 56 local school districts. For baseball, there are two instructors and sites. You can contact Steve Kirby at 937-654-6551. Classes begin on Jan. 20 at Miami East Elementary School in Casstown. The second site is a Wright State Univeristy’s Nutter Center. You can contact Rob Cowles at 937-360-5071. Classes begin on Feb. 17 at Wright State University’s Nutter Center. For softball, you can contact Randy Myers at 937-825-6146. 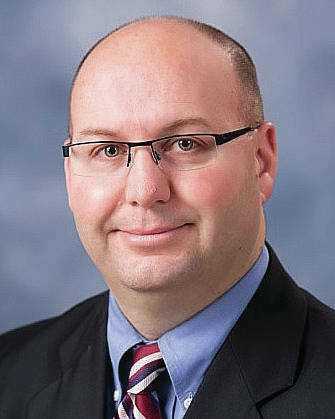 Classes begin Feb. 10 and will be held at the Tipp Monroe Community Services in Tipp City. I have been asked for a second year to lead a State Baseball Clinic by the OHSAA for existing umpires wanting to improve their skills. The all-day clinic will be held on Saturday, March 2 at Sidney Middle School. Instructors will include Division I and Div. II college baseball umpires as well as state and regional OHSAA tournament officials. Please contact Brian Huelskamp at 937-524-1376 to sign up. Barr is a 27-year OHSAA Baseball Umpire and the Baseball Umpire Education Director for the West Central Ohio Umpires Association. He can be reached at scottbarr402@gmail.com.